Sevin Dust: Why Grow Vegetables and Put POISON on Them? In the summer months I work as a plant merchandiser in the garden center of a national home improvement store. With the economy being what it is, many people are planting vegetable gardens. That’s admirable that so many people are taking the plunge into growing their own food. People will go to great lengths to plant a vegetable garden. They (hopefully) will pick the perfect spot in their yard: full sun for maximum growth. Some will carefully map it out, meticulously planning every detail. To avoid critter intrusions, they’ll fence it. Those who are more environmentally conscious may plan a watering system using a rain barrel. They’ll get down and dirty, tilling, digging, turning, weeding, making paths, setting up trellises and row covers for cooler nights. Then, when the weather is warm enough, they’ll venture to Lowe’s, Home Depot or a Mom-and-Pop garden center and buy seeds or plants. They will carefully nurture them and finally – plant their treasures with hopes of an abundant, cheaper and healthy food source for their family over the summer. Then they will systematically poison it. I was standing near the gate to the garden center chatting with the cashier. A customer comes up with a cart of veggies destined for her garden. She had collards, broccoli, lettuces and herbs. After she’d paid for her things she suddenly remembered she’d forgotten something: SEVIN DUST. It amazes me that people will go to such trouble to plant a garden, then poison it. It’s not only the food they are poisoning, but they are putting dangerous chemicals on the ground around their home. If they have a well as their water source, then over time, they are poisoning their well. If they’re trying to engage their kids and let them help in the garden, then Johnnie and Susie are being exposed to pesticides. If your pets go into the garden, Sevin Dust will get on their paws and fur. Cats will groom themselves; dogs, too, and it will get tracked into the house. Additionally, Sevin Dust and other chemicals which are supposedly safe (HA!) for food are toxic to bees, butterflies and other beneficial insects. People never seem to consider the good bugs: they only want to kill the bad ones. Sevin Dust kills the GOOD bugs as well as the bad ones! 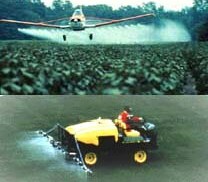 Studies have shown that a child absorbs 10 times the amount of a pesticide than an adult. Pregnant women should avoid areas treated with Sevin Dust because it can cause higher rates of fetal abnormalities. Women pregnant from May to September have children with higher instances OF fetal abnormalities because of exposure to lawn chemicals. Sevin Dust is a neurotoxin. Sevin Dust IS NOT ORGANIC. Sevin Dust can’t be used on your pets, either! It’s POISON! Categories: Chemicals/Pesticides in Your Food, Food, Food & Your Health, Health, Lawn Chemicals, Pregnancy | Tags: 7 dust, Children's health, economy, Family, food, gardening, Health, news, Parkinson's disease, Pregnancy, pregnancy & lawn chemicals, pregnant, seven dust, Sevin dust, vegetable gardens | Permalink.